The first showdown between LeBron James and Lonzo Ball was all King James. Not only did the Cavs down the Lakers, but James notched a triple-double, the 59th of his career. This ties him with Larry Bird for sixth all-time. Of course, there was also the short talk between James and Ball on the court after the game. James covered his mouth so TV couldn’t bring on their lipreading experts. Were they exchanging pleasantries? Talking about the possibilities for next year? Or was LeBron just telling Lonzo to nod for the cameras to make things look like something it wasn’t? 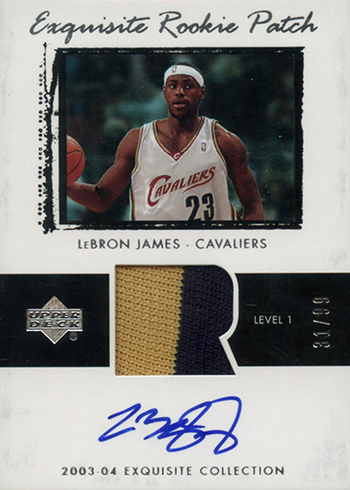 The 2003-04 Upper Deck Exquisite LeBron James is his top Rookie Card. And it’s not even that close. It is a symbol of the new super premium era it helped usher in. Limited to just 99 copies, it has both an on-card autograph and a patch swatch to boot. Looking at the bigger picture, it’s probably the most iconic sports card to come along since the 1989 Upper Deck Ken Griffey Jr. The Daily highlights a key player or personality in the world of sports or collecting from the past 24 hours along with one of their key cards.